The Billionty-Oneth Geek: TURBO KID!!!!!!!!!! I don’t know where to even begin with Turbo Kid! I didn’t know what I was expecting and it’s hard to put together what I received! But I’ll try! 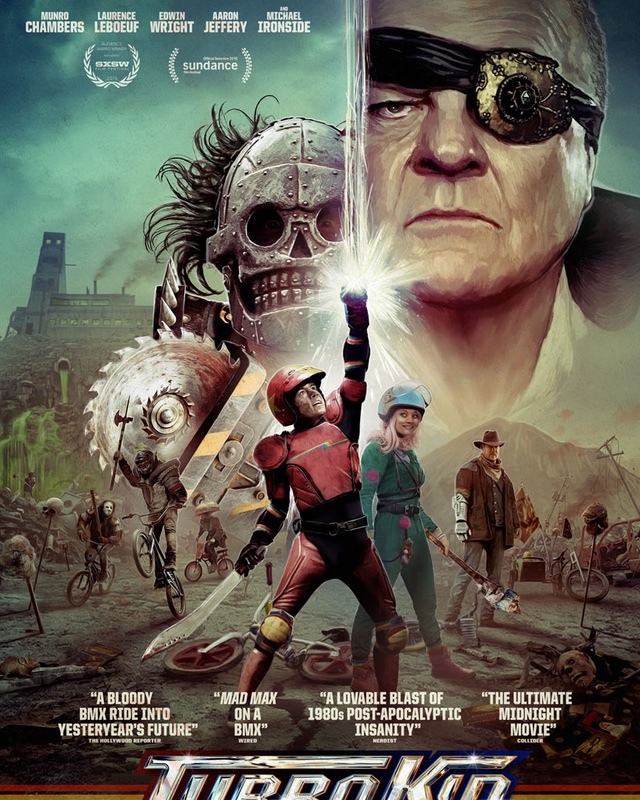 Turbo Kid takes place in a post-apocalyptic future where civility is all but a distant memory. It is a time when resources are far too few, requiring the processing and dispensing of human parts to create water. We follow a young kid, only known to us as the Kid, as he faces insurmountable odds in an effort to take down a tyrannical warlord hell-bent on destroying humanity. But the Kid isn’t alone! Armed with a Mega Man type blaster, he’s joined by a quirky and mysterious young girl named Apple and an Indiana Jones-like alpha male hero named Frederic. But are the trio enough to stop an army of spear-wielding, shoulder-pads wearing, bike riding hooligans? Turbo Kid is a love letter to the 80s. It’s so clear from the opening music number that we’re gonna get something 80s inspired. So when we see the Kid scavenging for cassette tapes for his walkman or 3D Viewfinder reels, we’re not surprised! For whatever reason, the 80s is it! Forget the 90s and 2000s! The visual style, the music, the costumes, the practical effects – they all help in bringing that atmosphere back. One can’t help but think about the original Mad Max movies when seeing the costumes of all the different characters. The synth heavy soundtrack is easily my favourite thing about the movie. It’s catchy music and really helps setting the tone of the movie. There’s a lot of things to love about the movie though! The practical effects and gore are quite amazing and it’s quite an interesting direction choice to include it! The movie could easily have been a children’s adventure movie had they not included all the blood and guts. But for whatever reason, it’s there and so skews to a more “mature” audience. I suppose it harkens back to the 80s style of movies when practical effects were more heavily used. When a bad guy gets impaled by an umbrella creating a bloodstorm, it’s almost perfect that the Kid removes the umbrella and uses it to shield himself from the bloody rainfall. The high-def cinematography was outstanding! Everything looked so crisp and clean for a smaller budget movie! This combined with the practical effects really made all the blood and guts really pop out! Michael Ironside really shines as the warlord villain in the movie. I don’t think I’ve ever seen him play such an over-the-top character (and this includes when he played Lt. Rasczak in Starship Troopers!). The kid who plays the Kid is alright! But I feel like of all the characters, he was the least interesting. Perhaps as the hero, he’s a bit more vanilla than all the players surrounding him. The best character really is Apple! She is cute and charming! There is a mystery behind her character and once you learn of what her deal is, all her quirkiness sort of makes sense! She and the Kid inevitably fall in love and you can’t help but root for the two (mainly because of her!). And when her secret is revealed, it made me wonder if naming her Apple was an allusion to a future technology! If you love 80s inspired movies, you definitely have to watch this! It is at many times random and inexplicable, but in the end, it’s all good fun! Til next time, later geeks!